WESTPEX, San Francisco Airport Marriott Waterfront Hotel, 1800 Old Bayshore Hwy. Exhibits, dealers, societies, USPS. Fri & Sat, 10-6; Sun, 10-4. Season pass $5.00; under 15 free with adult. Validated parking. Click for more details in the WESTPEX 2019 Ad! Philatelic Show, Regency Hotel & Conference Center (former Holiday Inn), 242 Adams Place off Route 111 (I-495 exit 28). Exhibits, dealers, youth programs, auctions, US and UN post offices. Fri, 11-6; Sat, 10-5; Sun, 10-3. Admission $3.00; season pass $5.00. 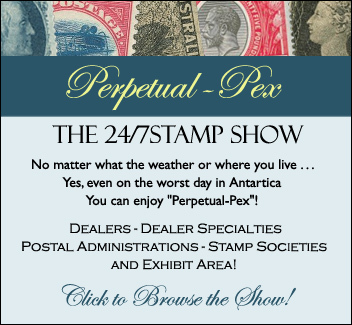 Click for more details in the Philatelic Show ad! First Saturday Monthly Show, Hampton Inn, 45 Industrial Park Rd. (I–95 exit 36, then I–195 exit 1). Dealer bourse, free breakfast/lunch. Sat, 9–3. Free. 603–978–3459. “Original” First Sunday Stamp Show, Masonic Hall, 14750 Sherman Way. Dealer bourse. Sun, 9:30–4. Free. Click for more details in the "Original" First Sunday Stamp Show ad! PIPEX, Red Lion Hotel on the River, Jantzen Beach, 909 N. Hayden Island Dr. Annual convention of the Northwest Federation of Stamp Clubs, with exhibits, dealers, auction, meetings and more. Fri & Sat, 10-6; Sun, 10-4. Free. Five–Star Saturday Stamp Show, Regency Room, YWCA, 735 E. Lexington (Glendale Ave. exit from I–134). Dealer bourse. Sat, 9:30–4. Free. Click for more details in the Five-Star Saturday Stamp Show ad! The Quality Sunday Stamp Show, Hotel Fullerton, 1500 Raymond Drive. Dealer bourse. Sunday, 9:30–4. Free; validated parking. Click for more details in the Quality Sunday Stamp Show ad! Click for more details in the Nashua NH Monthly Stamp Show ad! Rocky Mountain Stamp Show, Crowne Plaza/John Q. Hammons Trade Center, 15540 E. 40th St. (I-70 exit 238 at Chambers Rd.). Exhibits, dealers, USPS. Fri. & Sat., 10-6; Sun., 10-3. Admission $2.00; season pass $5.00. ASDA Spring Postage Stamp Show, The Watson Hotel, 440 West 57th St. Dealers, U.S. and foreign post offices, meetings. Fri-Sat, 10-6; Sun, 10-3. Free. NAPEX, McLean Hilton at Tyson’s Corners, 7920 Jones Branch Dr. Exhibits, dealers, USPS, society meetings. Fri & Sat, 10-6; Sun, 10-4. Free. Syracuse Stamp Show, Maplewood Suites, 400 7th North St. (Thruway exit 36; I–81 exit 25). Bourse. Sun, 10-4:30. Free. COLOPEX, Rhodes Center at the Ohio Expo Center, 717 East 7th. Exhibits, dealers, USPS, society meetings. Fri, 10-6; Sat, 10-5. Free; paid parking. Monthly Stamp Show, Holiday Inn, 9 Northeastern Boulevard. (U.S. Route 3 Exit 4). Dealer bourse. Sunday, 9-3. Free. Ernie@ebwpromotions.com; 978-658-0160. Montrose Stamp Bourse, Holiday Inn Akron-West, 4073 Medina Rd. (I-77 at Rt. 18). Dealer bourse. Sun, 10-4. Free. Lincolnway Stamps, 330-832-5992; lincolnway@sssnet.com. The Quality Sunday Stamp Show, Hotel Fullerton, 1500 Raymond Dr. Bourse. Sun, 9:30–4. Free; validated parking. let them know you found them on StampNewsNow.com. Your paid ads also earn you free Calendar Listings with links to your website and email addresses. Contact John Dunn today for an affordable display ad and sample magazines for distribution at your show. Email shows@stampnewsnow.com, phone toll free 603-424-7556, or fax 800-977-7550.